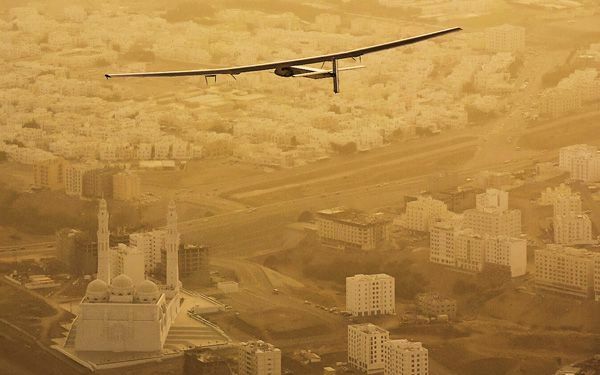 A Swiss solar-powered plane took off from Abu Dhabi in the United Arab Emirates on Monday. It marked the start of the first attempt to fly around the world without a drop of fuel. Solar Impulse founder Andr Borschberg was at the controls of the single-seater. It took off from the Al Bateen Executive Airport. Borschberg will trade off piloting with Solar Impulse co-founder Bertrand Piccard during stop-overs. The solar plane's journey will take months to complete. The lightweight Solar Impulse 2, a larger version of a single-seat prototype that first flew five years ago, is made of carbon fiber. It has 17,248 solar cells built into the wing. They supply the plane with renewable energy. The solar cells recharge four lithium polymer batteries. The company says the plane has a 236-foot wingspan. That is larger than that of the Boeing 747. But it weighs about as much as an SUV at around 5,070 pounds. The plane, in June, made an inaugural flight of two hours and 17 minutes above western Switzerland. That was just two months after it was unveiled. After Oman, the plane will head to India, where it will make two stops. Then it's on to China and Myanmar before heading across the Pacific and stopping in Hawaii. Then it will head to Phoenix, Ariz., and New York's biggest airport, John F. Kennedy International. The path across the Atlantic will depend on the weather. It could include a stop in southern Europe or Morocco before ending in Abu Dhabi. It will take longer to fly over the Atlantic Ocean because it is the biggest ocean and it has less sun beaming down on it. It will take many days or months to cross the Alantic Ocean because the Alantic Ocean covers approximately 41,105,100 square miles of Earth land and water. It will take long to fly over the Atlantic Ocean becaus it will depend on the weather there. If the the weather is very harsh, the pilot flying the plane will have to make a stop landing in southern Europe or in Morocco and it might take long before the harsh weather is over. I think it's incredible that the people who make the planes are now makeing a plane that doesnt need one sinle drop of fuel to go all around the world. It will take the longest to fly over the Atlantic Ocean depending on the weather, because if the weather is bad the plane could get lost and never come back. The plane will take longer to fly over the Atlantic Ocean depending on the weather, because if the weather is bad the plane might never get back to Abu Dahbi. It will take a long time for the solar energy airplane to fly over the Atlantic Ocean because the Atlantic Ocean is huge. Not only that, but the plane isn't as fast as other planes because solar energy isn't as powerful as oil. 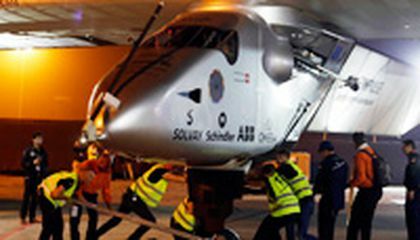 The Solar Impulse will take longer to fly over the Atlantic Ocean because of the weather. So , if it is raining,it will take longer beacuse it has no sunlight to run on. The reason why it takes so long to fly over the Atlantic ocean is because there will be many stops on the way. Also much of the sun bounces back into space so the solar powered plane will have to charge for a long time and stay there to recharge.